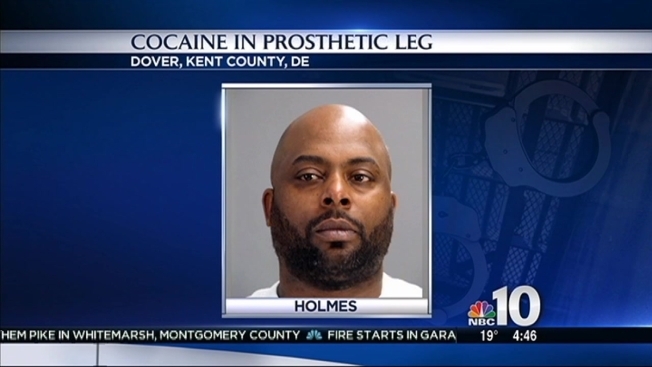 A Delaware drug suspect went out on a limb to transport a stash of cocaine, but he was busted when officers discovered the drug hidden inside his prosthetic leg, police said. Dover Police said 39-year-old Marlow Holmes was arrested Monday afternoon during a traffic stop. Police dogs alerted officers to the presence of narcotics inside the car Holmes had been riding in, investigators said. During a search of the car, officers said they discovered more than 28 grams of cocaine stuffed into the prosthetic leg that Holmes was wearing, and arrested him. Holmes will face charges of possession with intent to deliver cocaine and possession of drug paraphernalia. He was jailed, with bond set at $81,000. Police said they kept the drugs as evidence but returned Holmes' leg.